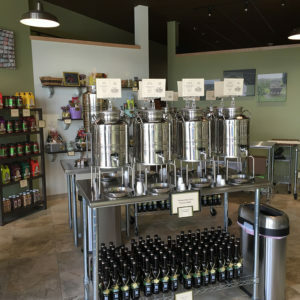 Lori Hackman owner of The Oilery in Sun Prairie talks with Shirley Gutkowski on, The Spot for Health about the healthy benefits of using fresh oils in your meals also in your everyday activities. recently on Beyond The Tank, following up with Curt on what happened after he appeared on Shark Tank. The Oilerie® Olive Oil Bar® store concept has revolutionized the way Americans buy olive oil. We have been hand bottling extra virgin olive oil and aged Balsamic vinegar since 2003. This is longer than anyone else in the USA. In addition, our production facility is located in a small town about an hour south of Rome. Therefore our exclusive and exceptionally short supply chain we offer you the freshest and finest products direct from Italy. Visit the Sun Prairie location today and find out what all the people are talking about. The Oilerie is located in the growing area on Sun Prairies’ west side. Located by the new Movie Theater, feel free to stop in or call for more information.